Gordon, left, and his aides Hymie Pincus (Harry Klein) and Joseph Aaron in a police lineup photo. Waxey Gordon was one of the original old-time gangsters whose career span the violent, disorganized days of the street gangs of the early 1900s into the 1950s when organized crime was at the height of its power. He began as a common pickpocket and ended as the head of a nationwide narcotics ring. He served time in prison, including a term for income tax evasion when he was allegedly set up by rival gangsters Meyer Lansky and Charles "Lucky" Luciano. The judge who sentenced him called his life of crime a "malignant cancer" on society. Gordon died of a heart attack in Alcatraz on June 24, 1952, at age 64. He was born Irving Wexler on Jan. 19, 1888, into a large, poor Polish-Jewish immigrant family on Manhattan’s Lower East Side. A pickpocket in his early days, he got his nickname "Waxey" from friends who said he was able to remove a victim’s wallet "as though it were coated with wax." The name Gordon was from one of several aliases he used. Described by police as a "gruff, powerful, thickset man," he had a talent for what the Jews called "schlamming," which translates to beating a person. His first arrest came in 1905 for pickpocketing and he was sent to the Elmira Reformatory in October where he served a short term before being paroled. He was arrested again in 1908 for parole violation and was returned to Elmira. Later that same year he was arrested in Boston on yet another pickpocketing charge and served four months. After his release, he traveled to Philadelphia and was again arrested for pickpocketing, this time serving 19 months. 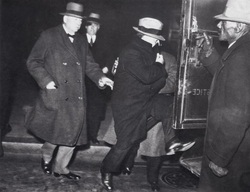 After his release, he returned to New York and became a strong-arm in the labor gang of "Dopey Benny" Fein. In 1914, during a street fight between rival gangs, a municipal court clerk was killed by a stray bullet. Gordon was one of 13 arrested in connection with the shooting, but only he and another man were charged with it. After a lengthy trial, however, both were acquitted because no proof was offered that either man actually fired the bullet that killed the judge. The same year he was acquitted, Gordon was again arrested and sent to Sing Sing for two years for beating and robbing a man of $465. He was released in 1916, and it would be his last prison term until Thomas Dewey prosecuted him for income tax evasion in the 1930s. By the time Gordon was released from prison on the robbery charge, Fein had left the labor rackets and Gordon hired himself out to other gangs as a labor goon, strike breaker, dope peddler and robber. Then Prohibition came along and Gordon’s life changed from street thug to powerful crime lord. In the fall of 1920, Gordon met Max "Big Maxey" Greenberg, who had recently fled St. Louis for Detroit after double-crossing members of St. Louis’ powerful Egan’s Rats Gang by taking sides with the rival Hogan Gang. While in Detroit, Greenberg began smuggling whiskey from Canada and quickly realized its potential for huge profits. He wanted to expand his operations, but needed $175,000. Greenberg traveled to New York in hopes that through Gordon, whom he had heard was a up-and-comer with connections, he could obtain financing from Arnold Rothstein, then the biggest crime lord in the city. Gordon had worked for Rothstein as a labor enforcer in the garment district years earlier and occasionally brought Rothstein good investment schemes. Rothstein met the two in Central Park and listened to Greenberg’s plan. The following day the three men met again, this time in Rothstein’s office where he made a counterproposal. Rothstein would finance the venture, but the operation would be based in New York and the liquor would be purchased and brought in from Great Britain, where he had established contacts. Gordon, who brought the two together, was cut in for a small percentage. Using the money from the Greenberg/Rothstein deal, Gordon launched his own rum-running business and became a wealthy man. Basically, his liquor would be retrieved from "Rum Row," the fleet of ships anchored off the coast of New York and New Jersey, just outside the three-mile limit (later extended to 12). It would then be brought ashore in speedboats (often being chased by the Coast Guard), taken to Gordon’s warehouses in Manhattan and on Long Island. There, it would be cut and stored, and then sold to restaurants, clubs and bootleggers in the New York metropolitan area. The best clientele always received the uncut merchandise. From his headquarters in the Knickerbocker Hotel at 42nd Street and Broadway, Gordon ran an efficient operation, which he modeled after his mentor, Rothstein. Gordon lived in a lavishly decorated, 10-room apartment on Manhattan’s Upper West Side and owned a large home on the Jersey shore. In 1925, however, government agents, who had been watching Gordon’s operation, got lucky when Hans Furhman, one of Gordon’s ship captains, allegedly unhappy with his cut from one of the shipments, decided to talk to the authorities. He told them about a Canadian steamer that was on its way to Queens with a hidden cargo of liquor consigned to Gordon. On Sept. 23, agents raided Gordon’s headquarters, arresting everyone there, including Greenberg, and seized maps, charts and radio codes. Gordon was arrested a short time later, but before his trial began, however, Furhman mysteriously died while in a guarded New York hotel room. The death was ruled a suicide and the case against Gordon was dropped. However, with his rum-running operation now exposed and his boats seized, Gordon abandoned his operations and moved to New Jersey. Along with Greenberg and Jimmy Hassell, Gordon muscled his way into the bootlegging business and opened several breweries that were licensed to produce near-beer. Gordon, however, rigged the breweries to produce the real stuff, and by 1930 he was the main supplier of bootleg beer to northern New Jersey and eastern Pennsylvania. In addition to political payoffs, Gordon further covered his operations by operating legal near-beer breweries in Patterson, Newark, Union City and Elizabeth. From these breweries, trucks left daily with legal near-beer shipments. Meanwhile, the genuine beer was produced in the same vats, but before it went through the de-alcoholizing process, it was pumped by underground pipes to bottling plants, sometimes miles away. The gang of triggermen Gordon hired to make sure both his beer reached their destinations was headed by Abner "Longy" Zwillman, who would go on to become a powerful underworld figure. Following the infamous 1930 Castelammarese War in which the two biggest East Coast crime lords of the time, Joe "the Boss" Masseria and Salvatore Maranzano, were killed, Luciano and Lansky emerged as two of the most powerful figures. Lansky and Gordon had been enemies for years, allegedly over liquor belonging to Gordon that had been highjacked under Lansky’s orders. By mid-1931, the feud had become very public and threatened the entire operation. In addition to his feud with Lansky, Gordon was also facing an investigation of his income tax returns. According to some sources, Luciano and Lansky, who had been very close for years, fed the IRS evidence that would send Gordon to prison. With the widely publicized successful income tax conviction in Chicago against Al Capone, the special agents of the Intelligence Unit of the IRS were reassigned to New York to begin the same process against Gordon and Dutch Schultz. For two years, six investigators worked full time collecting evidence against Gordon. During the final six months, a half dozen lawyers and 12 IRS worked exclusively on Gordon’s case. While Gordon was keeping an eye on Lansky and preparing himself for his IRS problems, he was also fighting yet another battle - war with rival gangs. On April 12, 1933, Gordon, Greenberg and Hassell were scheduled to meet in Hassell’s offices on the eighth floor of the Elizabeth Carteret Hotel in Elizabeth, N.J. Shortly after the meeting began, Gordon said he went down the hallway to the room of known mob prostitute and on the way passed two men in the hallway, but did not know them. He later said he heard "sort of like a rattle of dishes out in the hall," and when he went to investigate, he saw "some men ... running along the hall." He said the men told him they "just shot Max and Jimmy." Hassell’s body was found on the floor, near his office door. Greenberg was slumped on an unopened rolltop desk, with five bullets in his chest and head. Some believe it was Dutch Schultz who had sent the gunmen; others say it was Lansky. Still others believe it was Gordon himself who set it up. It’s unlikely, however, that if Gordon saw the gunmen they said anything to him because if they knew Greenberg and Hazzell by sight, they certainly would have known Gordon and thus would have shot him as well. After the shooting, Gordon hid out at his remote hunting lodge at White Lake in the Catskills in Upstate New York, where he remained until May when government agents tracked him down and brought him back on income tax evasion charges. Proving income tax evasion was no easy task, however, as described by Thomas E. Dewey in his book "20 Against the Underworld." Agents needed to find out, "For example, who sold the beer barrels to the Gordon breweries? Who sold the malt? Who sold the fleet of trucks the Gordon organization used for distribution? Who sold the oil, the gasoline, the tires, the brewing machinery, the cooperage coating, the air compressors, the cleaning compounds, the kettles and pipes, the hops, the yeast, the repair parts for the trucks and the materials for repairing beer barrels, the heads, shooks and rivets? Who installed the piping and the electrical equipment?" Dewey said in several instances the agents were in a foot race to get to the company records and banks before Gordon’s men did. Often they lost. The agents investigated companies and found that accounting entries had been re-written where they involved Gordon. There were times when agents went into New Jersey banks and were told to sit and wait. Soon Gordon’s men would show up and withdraw all of the money from his account and remove any evidence of ownership of the account. One time agents were arrested in a Hoboken bank by the local police. They were held until Gordon’s men arrived and carried off the records. One of the Gordon employees the agents were looking for was Samuel Guroch, who had opened a number of bank accounts under fictitious names. Guroch had been issued a subpoena to appear for questioning and ignored it. In June 1932, agents tracked him down and he was held in jail for contempt. His hearing was set for the following morning. In the middle of the night, Frank J. Pfaff, a U.S. commissioner, arrived at the jail and set the bail for Guroch at $500. Guroch promptly posted bail, walked out and was never seen again. Dewey’s men persevered, however, and by the end of the two-year investigation, they had interviewed more than 1,000 witnesses, reviewed 200 bank accounts, traced the toll slips of more than 100,000 phone calls, and sat through several thousand hours of grand jury examination. Gordon was indicted for attempting to evade payment of federal income taxes. The indictment at trial time claimed he had an unreported net income of $1,338,000 for 1930, and $1,026,000 for 1931. Agents arrested him at his hideout, a summer cottage at White Lake in the Catskill Mountains. The trial was set for Nov. 20, 1933, but Dewey had one more hurdle to clear. With the recent election of reform Mayor Fiorello La Guardia, U.S. Attorney George Z. Medalie, set to prosecute the case, resigned on Nov. 1. This pushed the 31-year-old Dewey to the forefront of handling the government’s case. When the trial opened, Dewey introduced the Gordon empire to the jury. He presented information on the two breweries, washhouses for the barrels, drops for the delivery and concealment of the beer, the barrels, a vehicle repair garage, five offices, two houses, several hotel suites and 60 Mack trucks. After nine days, 131 witnesses, and nearly 1,000 exhibits, Dewey rested his case. It was now up to Gordon to prove how he acquired these assets with a net income of $8,100 that he claimed for 1930. Gordon’s attorney tried to convince the jury that the business had been owned and operated by the now deceased Greenberg and Hassell. Any wealth Gordon had accumulated had been given to him by the two men. When the defense called upon an insurance man to prove that Gordon was actually a poor man, Dewey destroyed his credibility by producing several memos sent to the insurance company that showed Gordon’s heavy investments in several hotels. The final defense witness was Gordon himself. His testimony proved pathetic: He claimed to be "lured" into the beer business, and "lured" into investing in the hotels by Greenberg and Hassell. When presented with the paperwork for a building loan where he had signed a personal guarantee for $1 million and another for $795,000, his answer was simply that it was "just a favor" for Greenberg. Gordon testified that none of the brewery employees worked for him, instead they worked for "Max and Jimmy." The case went to the jury on Dec. 1, 1933 at 3:34 p.m. A verdict was reached in just 51 minutes. Back in the courtroom the jury foreman announced, "We find the defendant guilty on the first count, the second count, the third count and the fourth count." The newspapers reported "Gordon’s jaw sagged and his dark eyes (were) fixed in hatred on the men in the jury box as their verdict was pronounced." Seated behind Gordon was his wife Leah, who cried openly as the verdict was read. In addition to his conviction and jail sentence, Gordon suffered a personal tragedy as well. Over the years Gordon had tried to shield his family from his criminal activities. The veil of middle-class respectability that his wife and children lived under was shattered by Gordon’s high-profile trial and conviction. His wife, Leah, was the daughter of a rabbi, and Gordon’s oldest son, Theodore, was in his first year of pre-med at the University of North Carolina. His son remained in New York with his mother throughout the trial, but returned to school after the verdict was announced. Gordon’s brother, Nathan Wexler, called Theodore and urged him to return to New York a few days later to plead to the judge and Dewey for a sentnece reduction for his father, and for Gordon to be freed on bail while an appeal was pending. On his way back to New York, however, Theodore was killed in a car accident on snow and sleet covered roads. In 1940, Gordon was released from Leavenworth Penitentiary after serving seven years. Upon leaving he declared, "Waxey Gordon is dead. From now on it’s Irving Wexler, salesman." He traveled to San Francisco during the summer of 1941. At the time it was reported that he still owed the government $2.5 million in back taxes. When San Francisco police officers found him registered at an expensive hotel, he told them that he had come West to begin anew and was selling a "revolutionary type of cleaning fluid." Although he had over $400 in cash on him, the police arrested him for vagrancy. He posted $10 bail and left town. If Gordon became a salesman, he wasn’t an honest one. When America began sugar rationing during World War II, he was caught selling 10,000 pounds of it to an illegal distillery. He was convicted and served a year in jail. Turning to Gordon the judge said: "You have demonstrated repeatedly that there is no crime or racket to which you would not resort in order to make a dollar. Your latest and most dastardly offense is typical of your hostility, and it should ring down the curtain on your parasitical and lawless life." Gordon was sent to Sing Sing, but on March 8, 1952, was transferred to Attica. On April 10, he was charged in another federal indictment for participating in a coast-to-coast heroin racket. A warrant for his arrest was issued in San Francisco and he was transferred to California on May 21 to be arraigned. Gordon pled not guilty to two counts of narcotics trafficking. He was one of 23 people indicted in the nationwide narcotics case. Ten had pleaded guilty, and two were still fugitives. The trial, with the remaining 10 people, was set to begin on Aug. 18. Gordon was being held in the San Francisco County Jail, but was soon transferred to the federal facility on Alcatraz. Gordon, who had been ill for some time, was confined to the prison hospital. On the afternoon of June 24, 1952, Gordon was sitting in a chair speaking to a physician when he suffered a heart attack and died. 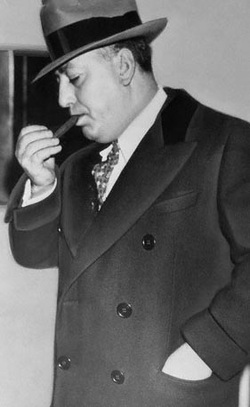 Gordon lights a cigar shortly after being found guilty on income tax evasion charges in December, 1933.